Rooms from 18000 yen per person, including 2 meals. Yoshigawara onsen is located on the tip of Noto Peninsular. It is not really a town, not even a village, since there is only a single isolated ryokan called Lamp no Yado. 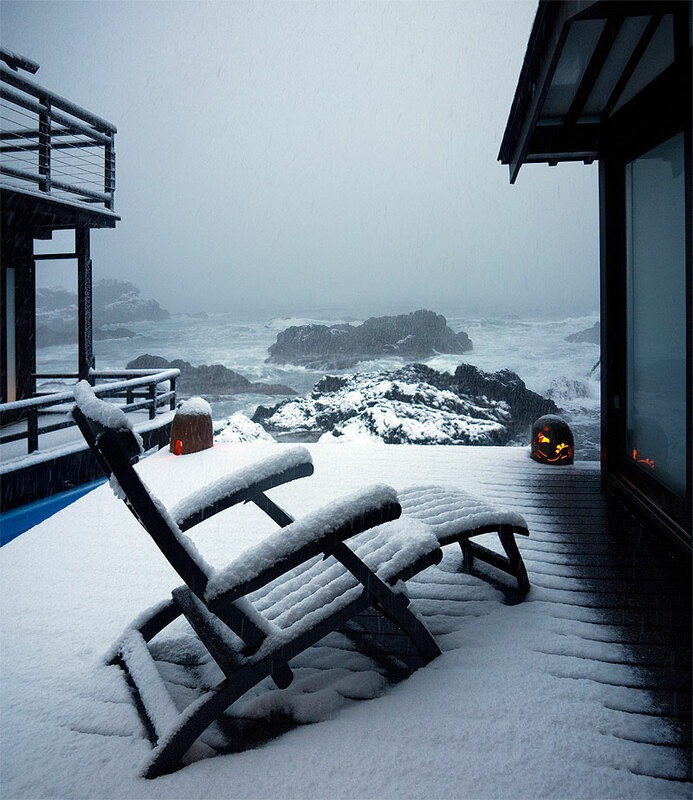 The name comes from the fact that the ryokan used not to have electricity, and all lightening was made by oil lamps. Nowadays, you can still find those lights in the dining room, providing a warm light during the dinner, but the ryokan has all modern comfort. Indeed, it can be sorted in the "luxurious ryokan" category. While many luxurious ryokan nowadays try to include occidental design in their walls, Lamp no Yado is clearly sitting on the tradition side, and you could easily feel drawn back in the past to a bygone period when warriors came to Noto peninsula to escape death. Still, the presence of a large, almost mysterious pool in the middle of the ryokan will remind you that you are in the 21st century. The inn was started around 1790. As many other secluded ryokan in Japan (including Yunishigawa, another of our favorite), it was established by descendants of the survivors of the Heike family who flew away from Kyoto avec losing the war against the Genji, at the end of the 12th century. Guests arrive at Lamp no Yado by a small road through the forest, before reaching a parking lot on the top of a cliff. 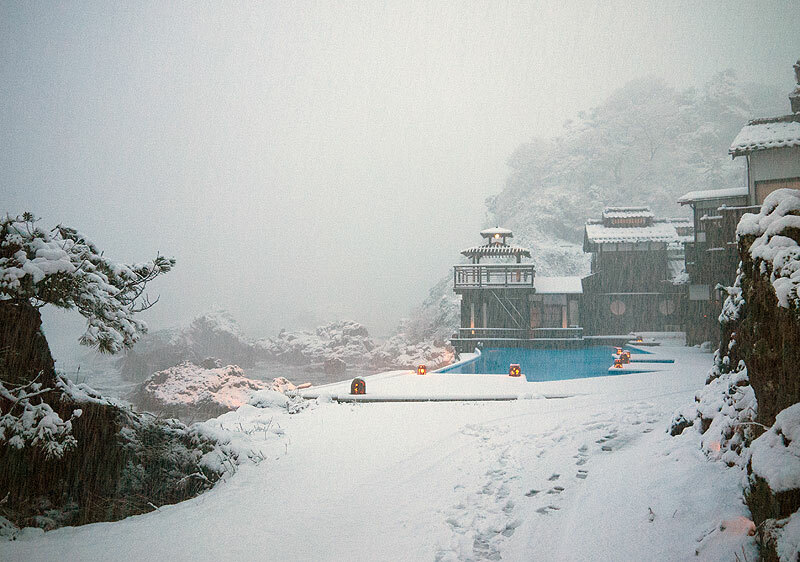 The ryokan is just below, facing the sea. The path leading to the ryokan is very steep, but offers a stunning view on the whole ryokan. 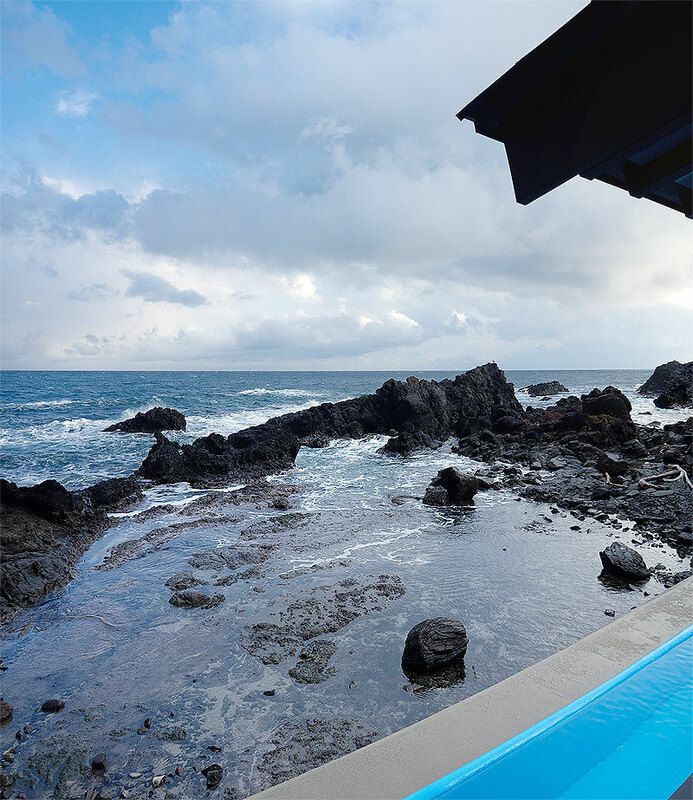 Eyes will immediately be attracted by the bright, blue pool along which are built several small houses - the most expensive rooms of the ryokan. A little further is the main building, were most of the rooms are located. Even though it was a sunny day, we were surprised by the darkness of the place: most of the walls are painted in black, and so is the wood. The surrounding cliffs have the same color, while the sea itself is scattered with black rocks, especially at low tide. And again, the blue pool contrasts deeply with the rest of the scene. This emphasizes the wildness of the Japan sea. Our room was a nice 9-tatami one, on the second floor, with a balcony offering a great view on the Japan sea and... the pool. The walls were white, but the wooden ceiling had the characteristic black color of that place. The toilets were a little cramped, and so was the place assigned to the mini-bathroom (there was no bath nor shower in the room). But the furnitures were beautiful. The futon, for example, were extremely comfortable, and the covers were of the highest quality. By the way, when I reserved, I was offered a choice between that room, or a 2000 yen cheaper and smaller one with a lesser view. The dinner was served in a large dining room - small parties might find themselves dining just next to an authentic samurai armor. The food served was rather original, and globally excellent. Rather unusually, no tempura were served - an almost mandatory service in most ryokan. Local specialties included a grilled abalone (awabi) with octopus, considered by many as a delicacy (although personally I find this shell too chewy to be really enjoyable). We were allowed to bring in our own sake we had bought earlier that day in Wajima, but the ryokan seems also to provide a fairly good selection of nihon-shu, including their own brand. The onsen are segregated, with one indoor and one outdoor bath for each gender. Rotenburo are facing the Japan Sea, and are nice at night, when illuminated by an orange lantern. They are not perfect, though: All baths are quite small, and while the men's rotenburo is not very well sheltered from the pool area, the female's one is in fact an artificial cave, which remove lots of the spirit one can expect from a rotenburo. But the best part of the onsen is the private kashikiri bath, which is accessed by a bridge over the pool. It is strongly advised to reserve that bath after the sunset... The small, dark building containing the bath is very atmospheric, and contains a small changing room with a transparent floor over the illuminated water of the pool. The blue color of that pool is glowing at night into the changing room - with its red interior wall - leading to a fairy mixture of colors. You can enjoy the moment while sitting on the tatami mat. 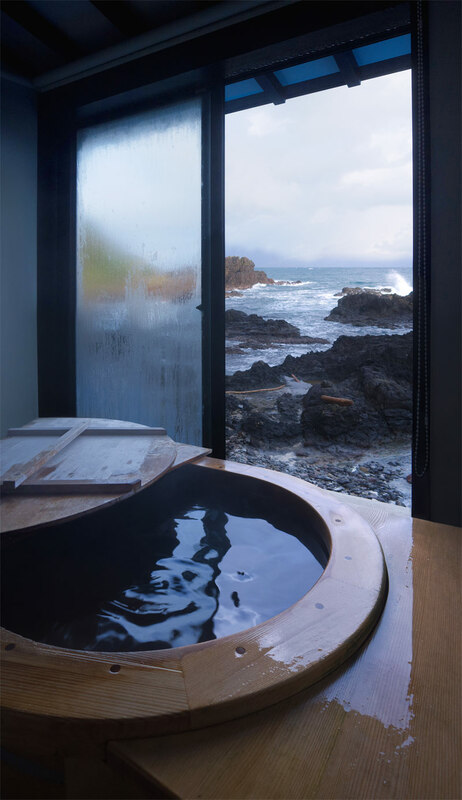 Or directly soak in the comfortable, rather large for 2 persons bath: open the large windows, and you will feel like in a rotenburo, with the Japan Sea in front of you. And to enhance the experience, the sea itself is illuminated by powerful projectors. The reservation costs 3000 yen for 50 minutes, but you might get it for free if you stay overnight. I see that this post is from a few years ago, but I hope it's still okay to inquire about this ryokan. Any idea if it is still as good as when you reviewed it in 2007? I am very interested in staying here when we visit in November. However, we will not be driving, and am unsure if it's possible to get here by train/bus from Wakura Onsen. (I am a Nisei Canadian, and my Japanese reading skills are rudimentary...I cannot figure this information out from the ryokan's website!) Thank you in advance! I have not been there since 2007, but I have heard that this place is still as good as it was. A little expensive, but an amazing experience. Access is pretty difficult without a car, and driving is strongly recommended - most interesting spots of the peninsula are unreachable without a car. Just returned from Lamp no Yado. We've stayed for 3 days there. Really nice and silent place. Onsen is in the top 10 Japanese onsen list (lonelyplanet.com version) like "Best hidden onsen" - can tell it is the truth - it is really not so easy to get there. got the tons of pics in my live journal with some additional info - but sorry it is in Russian. We're considering staying there during our upcoming trip. I'm confused though- some places are saying that there are mixed baths and Lamp no Yado, but others are saying the baths are segregated. Can you clarify? Also, do they have restrictions on tattoos? Thank you! Baths are segregated, but an incredibly nice family bath is available. For tattoos, as usually, it won't be a problem in a family bath, but could be an issue in the common baths - same as in all onsen in Japan.